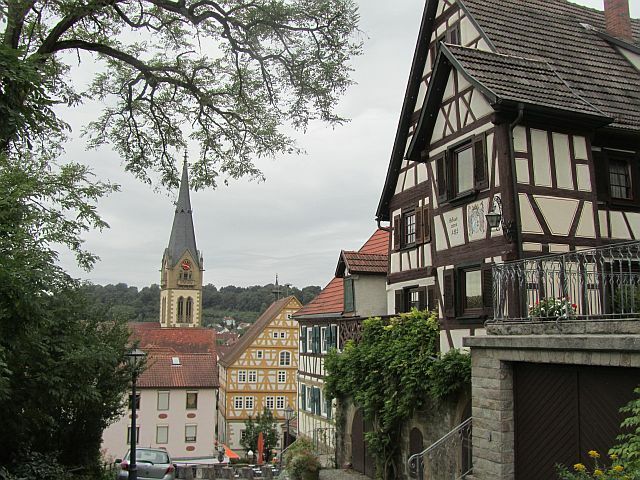 Möckmühl is one of the towns on the Pilgrimage route and it was going to be the end point of my revised timeline, which as you may recall, got revised again in Dörzbach. As with so many towns and cities Möckmühl was inhabited long before it received its city rights around 1250. Records show that there was a population already there and that the Monastery of Fulda had rich holdings in the area by the 8th century. During significant restoration of the Town Hall in 1992, Roman artefacts were discovered indicating that the city had been settled as early as the 2nd-3rd Century. 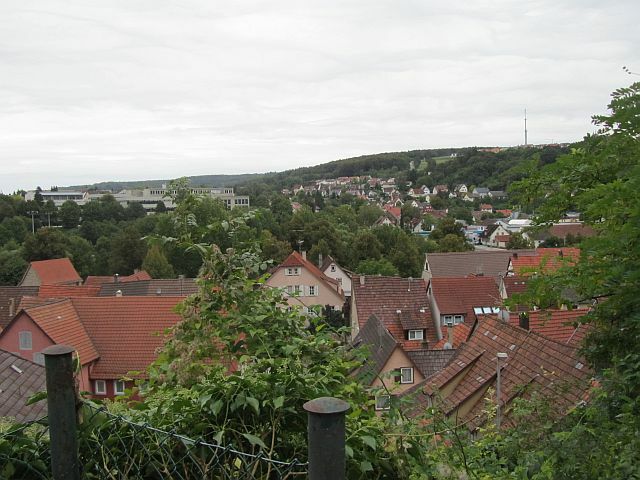 Möckmühl sits in slightly steep rolling green hills and is at the confluence of the Jagst (our old friend from Dörzbach) and Seckach Rivers in the State of Baden-Württemberg of South Western Germany. Among other things the site loaned itself to the establishment of a mill. 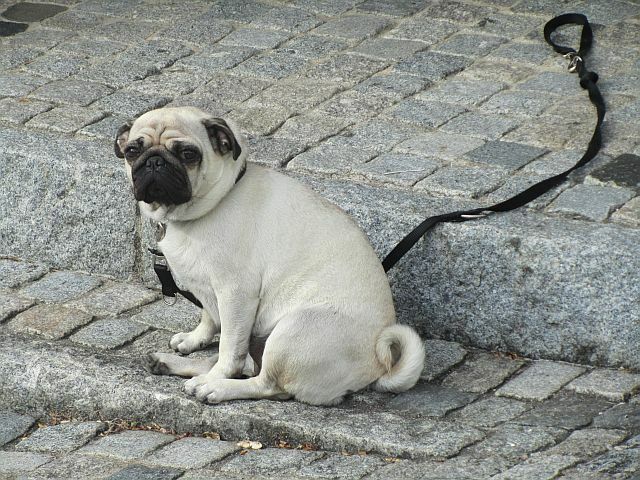 In fact its name is thought to originate from the Frankish Princess Mechita who owned a mill there. One of the early variant spellings of Möckmühl is Mechitamulin = the mill of Mechita. While it would not be the original mill, Möckmühl’s town mill closed its doors in 1959 (torn down in 1964) after 400 years of service. Compared to other medieval cities not too much happened in Möckmühl beyond the usual death and destruction due to the incessant battles and diseases of the times; basically nothing out of the ordinary. 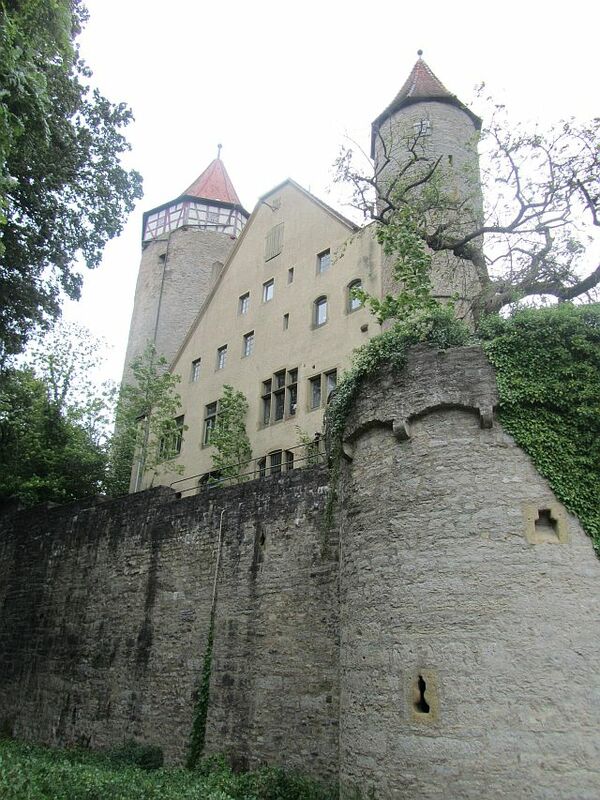 Its castle, built in the 13th century, is now a private residence. Spoiled my fun as you can’t even traipse around the grounds and the wall is too high to see over to take photos. Drat. However, I was mildly mollified because you can at least see the original tower of the castle (The Götzenturm) which at 25m high is too tall to hide behind a wall. The town had a surrounding wall thrown up in 1470, but like Rothenburg ob der Tauber, it didn’t do them much good either during the 30 Years War. As far as I can tell the city was not besieged, but 80% of the population died regardless as casualties of the war plus the plague. The town wall has a number of towers, one of the more famous or infamous of these is the Hexenturm (Witches Tower). During the mid 17th Century, witch hunts were common and various German cities avidly participated in the hunt. There is the story of one stalwart and tough woman in 1655, accused of making fleas. Personally I would have gone for something bigger, but I suppose back then fleas would have been a major deal. At any rate she never confessed to being a witch despite several sessions of “interrogation” including one of three hours of continuous torture, and 26 weeks in irons confined in the tower. She was eventually released and lived to the advanced age of 77. In fact she would have been alive when the last woman accused of witchcraft in Möckmühl was burned in 1667. 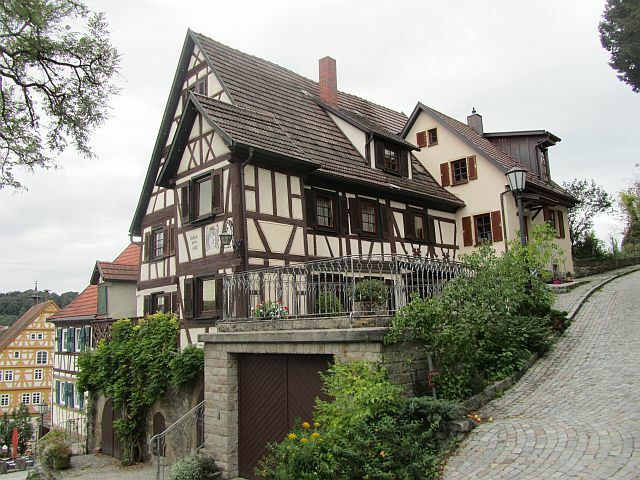 Despite standard turbulence throughout its history Möckmühl suffered little in the way of damage, and like Rothenburg ob der Tauber, preserved its medieval quality so buildings like the Town Hall, built in 1589-92, are still in use. It does not have Rothenburg’s charm though; the town square is small and uninviting and the streets radiating out from the square seem haphazard. It seemed that I always ended up where I started from no matter what street I took out, but then again, I do have that “circling thing” going for me. getting tired of cycling through the same three pair of underwear, two pairs of socks, two pants and two shirts. However, having said that, I did squeeze out enough clothes tolerance to spend two days in Speyer, my next stop. A vigorous walk up to the Castle at the top of the hill – where all good castles sit – got the blood moving after the bus ride. I didn’t wheeze once! On the way back down I enjoyed a very fine stroll through the old city, and much as I disliked adding weight to my backpack, bought small pottery chicken salt & pepper shakers. I haven’t gotten mundane yet about all the old timey buildings and hope I never do. It enchants me to see a building like the house built in 1515, still being lived in, and not only that, but added on to over the centuries so that now there are about seven eclectic residences in all. Or, the wonderful juxtaposition of the old and the new, such as the young woman leaning out of her third storey window talking on a cell phone in a building from 1615. This same building housed a voice school and had been a music school in the 1600s. I was at the right place at the right time and was treated to a delightful melody as I sat on a bench near the building in the city square. 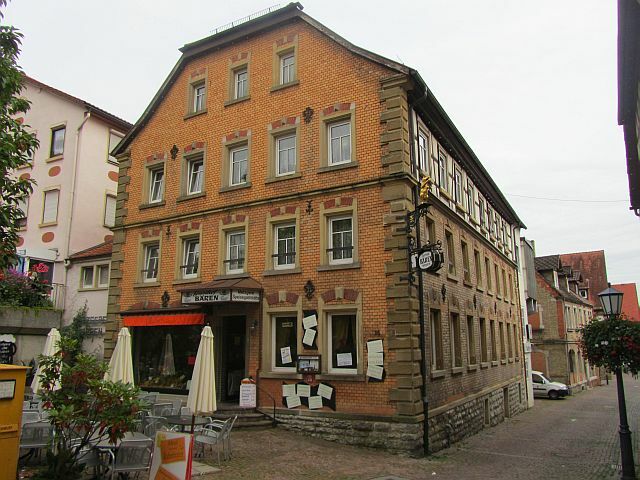 My accommodation in Möckmühl was my least favourite even though the building was very old. I had gotten lost (imagine that!) 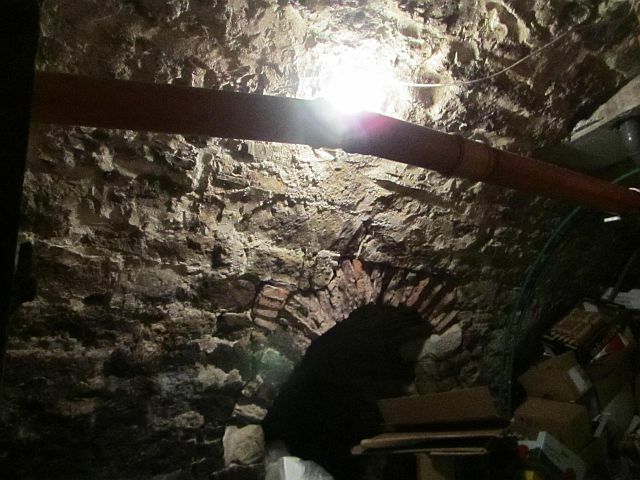 looking for the back door and ended up in the cellar. Talk about a perfect venue for scaries at Halloween. Lit by a single light bulb it could have passed for rooms in a dungeon. Walls of centuries darkened stone at least four feet thick, an oppressive ceiling and small arched openings leading to crypt darkness…. Gave me the heebie geebies! The Inn was a recommendation in the Pilger guidebook, but they neglected to mention that it was a smoking establishment. Smoke smell was heavy in my room so I had to open all five windows for a nice freshening. The good news is that I had a triple room on the corner of the building which meant light from two sides. The bad news is that the toilets (shared) were down a series of confusing hallways. to wander around in my jammies at night looking for the washroom. I’d probably end up in that creepy basement never to be seen again. I had gotten used to large German breakfasts of meat and cheese slices, fruit, yogurt, several different types of bread, eggs, juices, and cereals which provided enough fuel so that I only ate twice a day; in fact my second meal of the day was usually a snack. However, the brekkie here was chintzy by German standards – probably because they had to feed Benny. Benny is the largest dog I have seen in a while. He is a large breed, Bernese Mountain dog, which can get up to 120 pounds, but Benny was bigger than that and it wasn’t all big bones. He wheezed and puffed after coming in from a 15 minute walk as much as the rotund man who took him out. Still, like everyone I had meant so far, the proprietors were friendly.